When Kalyani asked me to do a guest post for her, I was pretty excited to say the truth as this will be my first one. I have known her for the past few months and I can say that she has become a close friend through the Blog Hop. Keeping in mind the festive month of the year I wanted to do something very very special for her. So presenting these “Lavang Latikas” from my grandmother’s kitchen which she usually prepares during Diwali apart from the classic “Adhirasams”. It had been some years since I made this. I do not know why I did not make this in the past few years but when thinking of traditional recipes this came in a flash. Both my children enjoyed this very much and hope you all do too. This is very easy to make and can be made and stored in a advance which will stay good for at least 4-5 days. In a bowl place all purpose flour with salt and mix well. Add ghee and rub with your fingers till they resemble bread crumbs. 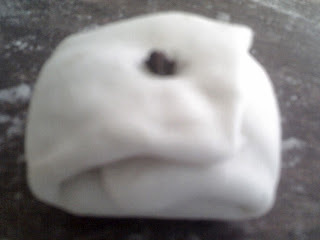 Add water little by little and make soft dough. Let it rest for at least 1/2 hour. Keep the dough closed with a damp cloth. Heat 1/2 cup of water in a vessel. Add sugar and let it dissolve completely. Add the milk at this stage and when the scum separates remove with a ladle or filter the syrup by passing it through a sieve. Cook further over low flame till you get to the one string consistency. Switch off stove and add cardamom powder. Keep it warm. Coarsely powder the almonds and cashew nuts. In a bowl crumble and mash khoya. Add the powdered nuts, sugar and mix well. If it is dry add few drops of milk or rose water to make it moist. Keep aside. Heat oil in a kadai. Slip the latikas one by one and cook till golden brown and crisp. Drain on a kitchen paper and immediately put them in the sugar syrup. Let it soak for at least half an hour and then it is ready to serve. Usually Grandma deep fries them in ghee which I just can’t imagine doing so. So I cheated by adding a few tbsps of ghee to the oil to not to miss out on the flavor part. Also I cooked the sugar syrup to 2 string consistency which she also does as it would make storage easier. 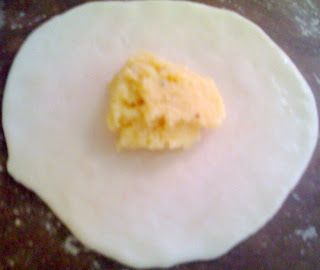 The sugar syrup will coat the lavang latikas well and it would be easy to serve too. congrats for the guest post…..its looking lovely….and the name is very unique!! Havent prepared them since many years, my grandma’s signature dish, makes me nostalgic..Tempting lavang latika Radhika..
Looks like they make magic in your mouth once you take a bite of these mouthwatering latikas!!! Fantastic clicks Radhika!! This looks delicious… It’s the first time I’ve ever heard the name… interesting! oh man!! drools.. i love them.. i thought they were made only in bihar and only during my childhood!! Can’t you parcel some over!!! Its new to me…Looks delicious..
Nice one Radhika. Looks absolutely divine. Looks tempting..had it in India long time back.Bookmarked,will try is soon. superawesome radhika- way to go gal and the pics are deadly ! congrats on the guest post and that too such a delicious looking authentic sweet. Congrats on the guest post. Thse sweets look absolutely delicious. Delicious dish.. I never tried this dish before. Should give it a try. Wow, a big wow. just awesome. This is the first time I’m hearing this and I’m also going to try out this. Btw, tried the adhirasams. Came out perfect. sooooper! I had never heard of this lavang latika! If your paati used to make it, is it traditional Tamil dish?? Congratz on th guest post…really tempting..
Lavang Latika looks YUM !! perfectly done !! Hi Radhika, loved your post as well as your blog…lots to learn, I am a newbie in the world of food blogging and just learning how to start interacting with fellow food bloggers like me and making friends too to learn more….your blog definately will be one of the platform i am looking for..thanks! Thanks for these wonderful pictures of the lavang latika and Kiran thank you for the wonderful link.